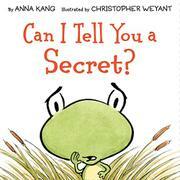 Kang and Weyant, following up on their 2015 Geisel Award for You Are (Not) Small, have created this confession story as a constant dialogue between Monty and readers. Monty has a problem—a big problem—for a little frog. Thanks to the creature’s expressive eyes and innocent questions, young listeners will experience compassion in action. “What’s that?” Readers are asked in response to a presumed interaction. “You think I should tell someone? Like my parents? Are you sure?” It takes three tries for Monty to gather the courage to confess to Mom and Dad. The full arc of having a secret, keeping it hidden, and finding a way to get help is played out in this lighthearted story. The lime-green oval faces and big eyes of Monty and the adult frogs are the focus of every page, prioritizing the feelings of individuals. This little secret has grown into something huge and burdensome by keeping it hidden. And Monty becomes wiser by learning to conquer fear. Yet unfortunately, the title of this book is both misleading, as Monty never even utters these words, and nails-on-the-blackboard painful to grammarians.